(Last Updated : 26.03.19). 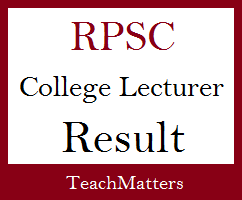 RPSC College Lecturer Result 2019 - RPSC declared Interview Result, Cut-off Marks of College Lecture exam 2014 held in 2016. Rajasthan Public Service Commission conducted College Lecturer Exam 2016 in April, June & July 2016 for Paper-III, Paper-II & Paper-I respectively. Candidates who appeared in College Lecturer Comp. Exam 2014 can check their result as subject-wise and category-wise along with cut-off marks. The commission has declared College Lecturer Result 2019 on the basis of written exam. Candidates who successfully qualified in this exam will be able to download Detailed Application Form and Interview Admit Card for College Lecturer Interview Exam 2016. Final Result has been declared on the basis of interview and exam marks. Check here latest result of college lecturer exam 2016 along with cut-off marks, merit list, interview letter. Check here final result and interview cut-off marks for the post of College Lecturer in Higher/College Education Department, Rajasthan. College Lecturer Comp. Exam 2014 was conducted in 2016 by RPSC. Subject-wise result, cut-off marks and interview letter schedule has been released by the commission. Here is the detail. RPSC has declared the written test result of the following subjects so far. Qualified candidates can submit their detailed application forms for the interview as per the schedule. Here is the result of College Lecturer Exam 2014 held in 2016. RPSC has released interview schedule and interview letter for various posts of College Lecturer. The Commission conducted interview for the post of College Lecturer English from 22.10.2018 to 30.10.2018. Interview Dates and admit card for interview to be held in 2019 can be checked here at the below link. Here is the schedule of downloading detailed application form for successful candidates in college lecturer exam 2016. Download Notice regarding Submission of Detailed Application Form (16.03.17). Cut-off Marks as subject-wise and category-wise has been declared by RPSC along with the result of college lecturer exam. Candidates can check cut-off marks of the concerned subject and category in the result section uploaded on the official website of RPSC i.e. www.rpsc.rajasthan.gov.in. For the Written Test cut-off marks check the result whose link is given above. Merit list and marks list will be declared along with the final result. Even unsuccessful (in written exam) candidates can also check their written marks to be uploaded after interview.